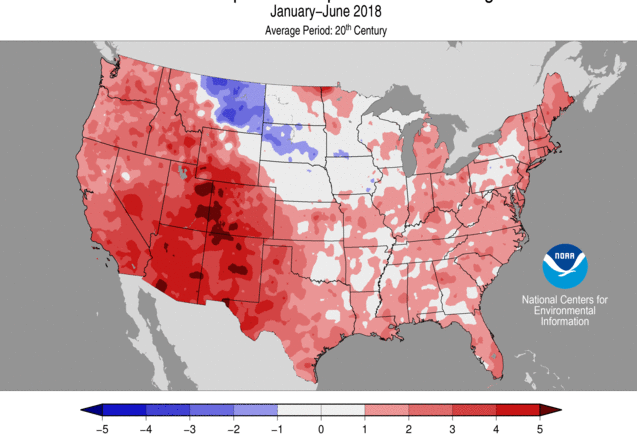 Despite another year of record heat waves — and we have yet to see what August 2018 will bring — climate change deniers in Congress and elsewhere continue to spout their unsubstantiated claims, undermining the critical action needed now. The significant weather anomalies in the first half 2018, summarized in the June 2018 National Climate Report, all are consistent with a continually warming planet. Fortunately, this being an election year, the ignoramuses in positions to influence policy are at risk of being defeated — but only if you vote. In this sad new era of fake news, as well as cybersecurity threats to widely used electronic voting machines, voting en masse and demanding a paper trail is imperative. But, given that 2018 is shaping up to be the fourth-hottest year on record, much work remains. Yes, despite the nefarious, despicable ongoing efforts of voter suppression, it is imperative to vote against the whorish climate-deniers in office, at all levels of government, because even your local town or city council can set policy that can make a difference. Consider the numerous cities and states and companies that have vowed to adhere to the Paris Climate Agreement. Demand of your representatives they abolish the $20 billion in subsidies gifted to the fossil fuel industry each year. Those are your tax dollars at work, destroying the environment, jeopardizing the futures of generations to come — including generations now.